Well there had to be at least one cold salad on the list, but this one is a little different. 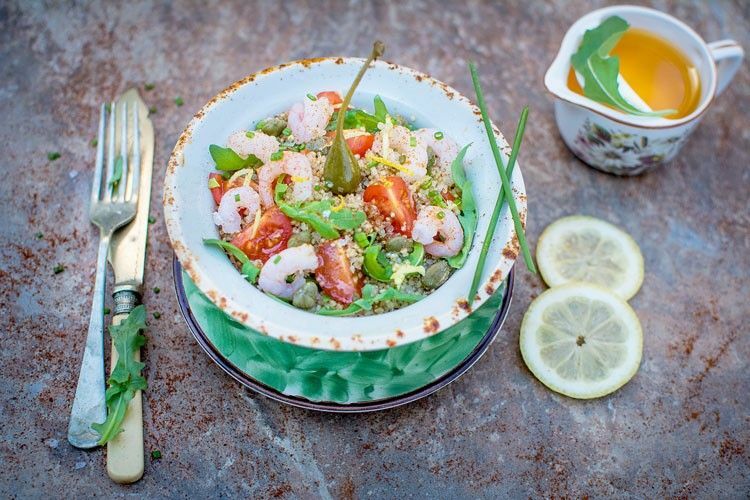 Quinoa lovers know that it’s really great as a garnish or as a base of salads and pairs excellently with vinaigrettes because of how it soaks up flavour. However, this riff on classic tabbouleh uses sprouted quinoa instead. Sprouting is easy and just takes a little patience, and there’s growing evidence that it can add nutrition to your food. It’s also tasty and offers an interesting texture. Tip: You can use sprouted quinoa in quinoa recipes interchangeably and you can even use it as a flour if you let it dry and then grind it. If you’re feeling a little bored of the same old oatmeal, you can replace it with our cinnamon-scented quinoa. It cooks up quickly and easily and is a great breakfast alternative. It’s also a really nice morning snack for people who can’t have gluten because it’s naturally gluten-free and doesn’t have any of the fillers or added fat, sugar, or salt that you often find in store-bought gluten-free alternatives. And speaking of a healthy, additive-free gluten-free breakfast, our quinoa granola is an excellent choice in the morning. It’s packed full of of iron and is low in sodium, which is hard to beat with anything you’ll find at the store. Plus, it’s super easy to make and stores really well. If you’re looking to take it a step further and turn it into a great on-the-go snack, check out our gluten-free cranberry granola bars.